We all need to do traveling at some point in our lives whether it is for work or for pleasure but a lot of us do not have or enjoy the time it takes to get to our location. That is why aircraft traveling is the most popular and quickest way and I personally enjoy flying. Although airports can be well organize and fun to walk around, there can be some waiting time you need to kill. However, once you get aboard it will be worth it if you get a good seat. Many Aircraft interiors can also be a negative because they have little space, are uncomfortable or boring. But there will be redesigns and upgrade to make your flight more enjoyable. Aircraft interior designers have the job of making our aircraft journey as smooth as possible and to do this they need to think outside of the box and use the space as well as possible so that you can get more of your money’s worth. In Germany in April 5th 2016 a group of aircraft interior experts got together and decided that certain interior aircraft cabins deserved to be awarded with a 2016 Crystal Cabin Award. · The Boeing Company who designed the self-cleaning lavatories so at least you have a chance of not catching the flu while you travel (The Greener Cabin, Health, Safety and Environment Award). · B/E Aerospace because they are the ones who invented the light blue hue flexible lighting system which they call Viu LED Lighting System (The Cabin Systems Award). · Manon Kuhne from Delft University in the Netherlands and she was the one who tried to make your sleep more comfortable with the HeadRest head hammock (The University Award). 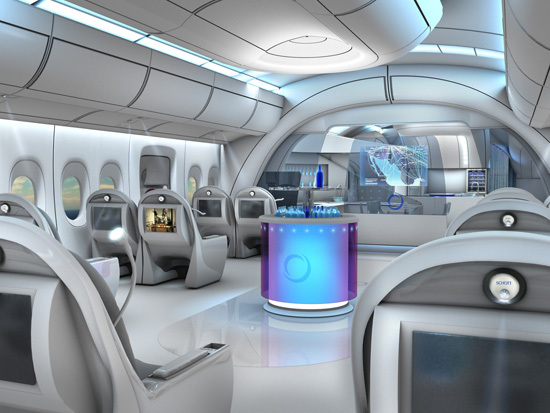 · Zodiac Aerospace made the visual concept for different spaces within the aircraft such as having a level for a meeting room, lounge and even sleeping (The Visionary Concepts Award). · Etihad Airways (in cooperation with Acumen Design Associates) have created the Etihad B787 First Class Suites. They are designed to give you a lot more leg and all round space while in the aircraft, they will be slightly boxed off to allow more privacy but have a gap that you can get in and out of. The aerial view of this reminds me of a train that has compartments with passageways in between them. You may have to look for discounts or use your frequent flyers miles (The Cabin Concepts Award). · SEKISUI Polymer Innovations creates Infused Imaging which is patterns in the materials that are designed by the aircraft carrier. Instead of seeing one to two solid colors you could end up seeing a wide range of colors and patterns (The Material & Components Award). · Rebel.Aero Ltd has a redesign for the seats that can allow for more space and be comfortable. This redesign also allows for two different seating positions (The Passenger Comfort Hardware Award). · Lufthansa Systems has created the BoardConnect Portable which is a lightweight sever, modem and entertainment device (The Electronic Systems Award). Aircraft traveling may have a long way to go but it will be worth it. If you are able to test these award winners out go for it. Gaetano Esposito is author of this article, he also writes for Eleventy traveler blog.